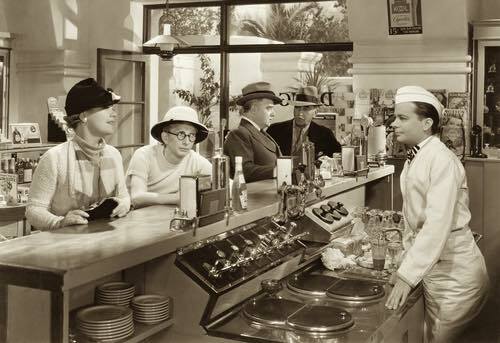 You'll have fun trying these old fashioned egg shake recipes once used by pharmacy soda fountain operators. Similar to an eggnog yet uniquely different, some call for milk while others contain sparkling soda water. These refreshing beverages are not only delicious, but spark great conversation. When an egg is added to a milk shake before shaking it, it becomes an egg milk shake. Acid syrup flavors should never be used in an egg shake as they tend to curdle the milk or cream. The old fashioned egg shake recipes below call for raw, uncooked eggs or egg whites. To avoid any health risk, please visit my Eggs and Salmonella page for simple instructions on how to safely use the old time recipes. 1 ounce any desired flavor of syrup, 1/4 glassful finely shaved ice, enough milk to make 12 ounces, 1 egg. Shake and strain. This formula makes a genuine egg milk shake. Use very little ice. Charge 15 cents. One fresh egg, 1 dash strawberry syrup, 1 teaspoonful sugar. Place in a glass in the order named and fill with milk; shake well and strain in glass. Top off with grated nutmeg. Charge 15 cents. One egg, 1/2 glass shaved ice, 1 ounce pure water. Shake thoroughly; then add slowly, while constantly stirring enough Vichy water (or soda water) to fill the glass. Price—12 ounces, 10 cents. 2 ounces chocolate syrup, 1 ladleful cracked ice, 1 egg, enough milk to nearly fill glass. Pour the syrup into the glass, add the egg, and cracked ice, then fill the shaker about one-third full of milk and shake. Finally, add the balance of the milk to fill the shaker about two-thirds full. Shake well and strain into a clean glass. Top off with a little powdered mace, nutmeg, or cinnamon. The above formula is recommended for making a chocolate egg shake. Price—12 ounces, 15 cents. 1 ounce chocolate syrup, white and yolk of 1 egg, small quantity of crushed ice. Shake well, then add plain carbonated water sufficient to fill tumbler. Stir with twist bar spoon, strain, then pour alternatively from tumbler to shaker, and serve. This drink is rather thin and should not be priced at more than 10 cents. 1 ounce chocolate syrup, 1/2 ounce vanilla syrup, 1 egg, piece if ice size of walnut. Shake well together, add plain soda and pour from shaker to glass three times; top off with nutmeg. Price 12 ounces—10 cents. Break and separate an egg; beat up the white with half an ounce of chocolate syrup, and the yolk with a similar quantity of pineapple crushed fruit syrup; beat the two mixtures well together and then shake up with an ounce of chocolate syrup and a scoopful of vanilla ice cream. Juice of 1 orange, 3 teaspoons powdered sugar, 1 egg, 1 ounce grape juice, 1/4 ounce port wine, small quantity shaved ice. Add ingredients to glass, fill glass with plain water; shake, put in 12-ounce lemonade glass, finish with a slice of pineapple and a cherry. The "American Gentleman" may be livened up by the application of a little carbonated water. Price—12 ounces, 20 cents. Juice of 1 lemon, 1 egg, 1 tablespoonful powdered sugar, 2 ounces shaved ice. Shake thoroughly, strain into a 12-ounce glass, and fill with ginger ale. The Big Gun Egg is a good thirst quencher. Charge 15 cents. Use a lemonade shaker. Put in a scoopful of soft vanilla ice cream, 2 teaspoonfuls pulverized sugar, one scoopful of pineapple ice, and one egg; beat the mixture well with a spoon and pour on a fine stream of carbonated water to make a 12-ounce drink; top off with whipped cream and serve with two straws. To 1 egg in mixing glass, add 2 ounces of strawberry syrup, 2 ounces of plain cream, shake well with ice, and serve in bell glass filled with carbonated water. Charge 10 cents. To small quantity of shaved ice in a tumbler, add 1 whole egg, a little sweet cream, and maraschino syrup (syrup from a jar of maraschino cherries may be used); shake the whole well and fill the glass with milk. Price—12 ounces, 15 cents. A small quantity of shaved ice, juice of 1 lemon, 1 ounce grape juice, 1 egg, 2 tablespoonfuls powdered sugar. Dispense in a 12-ounce lemonade glass, fill with carbonated water, and garnish with an orange slice and a cherry. Charge 15 cents. 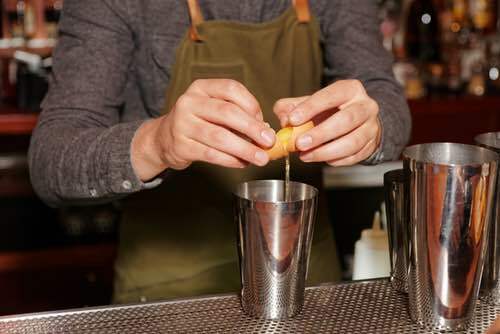 Take two mixing glasses, break an egg, putting the yolk in one glass, the white into the other; into the glass with the yolk add one ounce cherry syrup and some cracked ice, shake, add small quantity carbonated water and strain into a 12-ounce glass. Into the other mixing glass add one ounce plain sweet cream and beat with a bar spoon until well whipped, add one-half ounce lemon syrup, then transfer it into shaker and add carbonated water and float mixture on top of the yolk and cherry syrup. Serve with two straws. In bottom of glass put pieces of ice, one tablespoonful of pineapple sherbet. Over this pour a ladleful of grated pineapple, then strain the contents of shaker over all, garnish with fruit and serve with a spoon and straws. Charge 20 cents. Into a 14-ounce glass pour 2 to 2-1/2 ounces of strawberry syrup. Into this break two eggs and add a few dashes of Jamaica ginger, 1 to 2 ounces of sweet cream, and a little fine-shaved ice. Shake thoroughly and fill with carbonated water. Strain into clean glass and serve. May be topped with spice, if desired. The carbonated water should be added to the syrup and eggs in the shaker and from the shaker strained into the serving glass. Price—12-ounce glass, 20 cents.